4 × = 12 Required Please enter the correct value. The Money Morning Apple stock forecast for 2016 projects shares going sideways in the early part of the year, but new highs by the summer or fall. The current sour mood on Apple Inc. (Nasdaq: AAPL) will bleed into January and possibly longer. Poor guidance from several Apple suppliers over the past several weeks has had analysts chopping their Q1 2016 iPhone sales forecasts. And the negative publicity has dragged down AAPL stock. 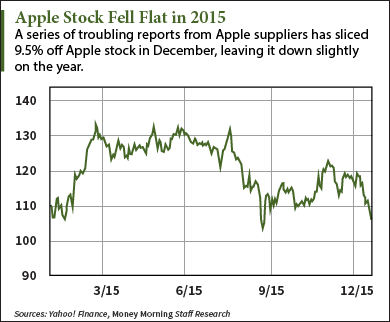 Since Dec. 4, the Apple stock price has dropped by about 9.5%. What's happening in this quarter will get reported at the end of January. Since the December quarter is always Apple's biggest thanks to holiday sales, it tends to control the direction of the stock in the early months of the year. A weak Q1 Apple earnings report – or worse, an earnings miss – would keep the Apple stock price down, possibly pushing it below $100. But investors shouldn't get too distracted by all the predictions of a decline in iPhone sales in Q1. While it won't be the blowout quarter we saw a year ago, an actual year-over-year decline would be surprising. And Apple CEO Tim Cook warned analysts in 2013 about using supplier data in their forecasts. "The supply chain is very complex and we obviously have multiple sources for things, yields might vary, supply performance can vary. The beginning inventory positions can vary," Cook said in the Q1 2013 earnings conference call. And remember, as recently as August, analysts had themselves twisted up in knots over worries that China's slowing growth would hurt iPhone sales there. Those fears proved unwarranted, as Apple reported a 120% year-over-year rise in iPhone sales from China in Q4. The silver lining to this month's falling iPhone sales forecasts is the gift of lowered expectations. Wall Street is factoring in this bad news now. If the iPhone can beat these lowered forecasts and sell enough to exceed last year's numbers even by a little bit, Apple stock will get a lift. The picture brightens, though, when considering the Apple stock forecast for the rest of 2016 and beyond. What in the world is going on with EKSO???? I like Apple and your insight helps a lot. Keep the information coming it helps us beginners.